The landscape design video below is a compilation of a few backyard projects we designed and installed in the last few years. Each project was designed for our clients specific needs and wants for their ideal outdoor living environment. The first project is a 600 sf paver patio surrounded with landscaping. For the install we used a Techo Bloc Athena paver. The second project is a three tier stamped concrete patio and walkway with landscaping and boulder work. The patio was stamped using a seamless texture and colored with a platinum gray and classic gray color combination. The third project is a two tier stamped concrete patio with landscaping and outdoor lights. The patio was stamped using a large slate pattern on the top tier and a seamless slate texture on the bottom tier. The color of the patio was platinum gray and classic gray color combination. The wall block that was installed was Techo Bloc mini creta in Champlain Gray color. 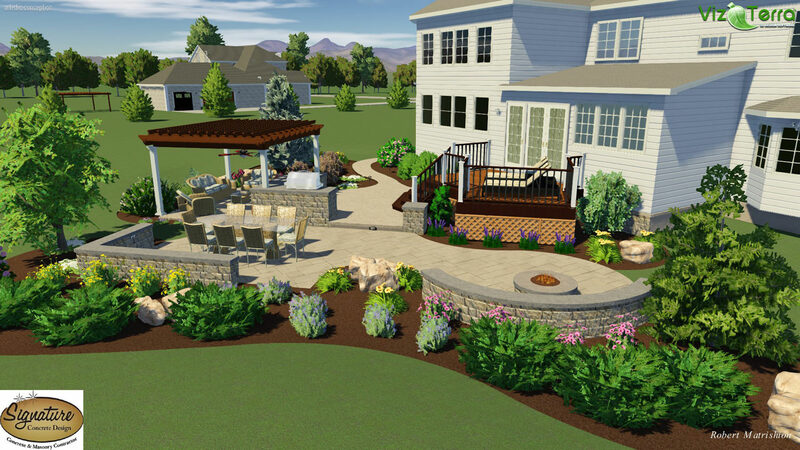 The fourth project is a massive backyard oasis that includes a two tier stamped concrete patio with a Trex deck, an Techo Bloc outdoor kitchen with a bar, a pergola, outdoor lighting, and landscaping.